"D-Ring and Strap" tie downs are an inexpensive, rugged product used on a multitude of cargo transporters, from 1,000 foot ships to simple utility trailers. D-Rings from Tandemloc are forged alloy steel with low carbon steel straps for excellent weldability. We recommend wrapping the welds around the edge of the straps and avoid heating the D-Ring over 500° F (to prevent downgrading the material strength properties of the alloy steel). Please note that the strength ratings expressed are "ultimate" loads or "Breaking Loads" and not "working loads." The strength is based on a single vertical pull, although most applications will result in the load direction to be at an angle or a compound angle. Consider the angle(s) of pull you will encounter with your application as it increases the strain on the tie down at any given weight load. For lifting purposes, where a 3:1 safety factor to yield is required, the WLL (work load limit) is 1/3 of the max. Load without yield. When proof testing is required, the proof test is two x the WLL. Lifting D-ring and straps are by request only and have additional cost. 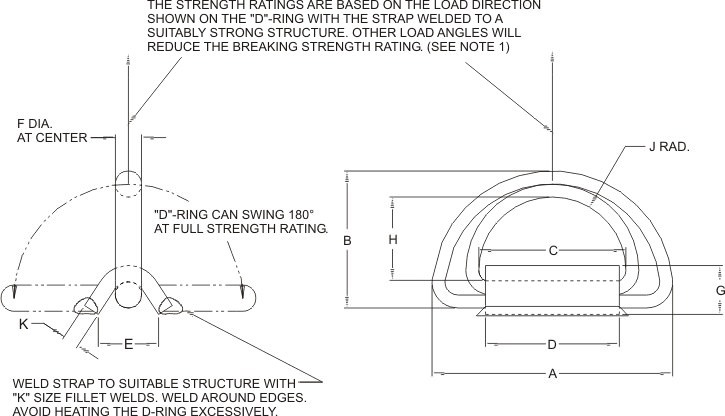 For lower strength stainless steel D-Ring and Straps, see AJ10A00-DS07. Parts that are blasted and sprayed with a rust inhibitor have a -BRI after the part number. D26 and D110 are MIL Standard 209 Complaint. PLEASE NOTE: D-Rings and Straps are ONLY sold together and these items may NOT be purchased individually.